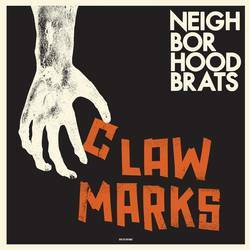 I’ve always liked Neighborhood Brats, but I don’t remember the band having so much variation in sound. Over 11 songs, this record maintains their melodic and forward-moving punk but with ominous foreboding organ, and even banging piano at times. While this growth stands out, it also doesn’t change who the band is. These details add depth, not a change of direction. At times Claw Marks is ominous and frustrated at the world, but most of the time it's calling for action, solidarity and reflection. It's short, fast, and loud like the genre rulebook demands, but it's way deeper than that too. The tempo never changes much but the tone is mixed up nicely throughout all 11 songs here. While it’s what one would expect of the punk genre, it’s never stale or stagnant. Instead the band mixes up their tone while maintaining a consistent identity as they explore different emotions. It’s equally internal and looking outward at the world, meaning that it doesn’t overplay its hand at either. What I keep coming back to is that this record is really nuanced, but also really strong from start to finish. It’s powerful, angry punk but it’s much more than that. It takes a special band to rip through 11 songs in 24 minutes without it all starting to sound the same. It’s a fitting title in Claw Marks. This is a record that scratches, bites and confronts, not only leaving scars, but lessons. Posted Jan. 21, 2019, 10:15 p.m.
Posted March 30, 2019, 10:56 a.m.
Posted Feb. 6, 2018, 8:15 a.m.
Posted Jan. 20, 2015, 9:44 p.m.